Ronan Byrne, aka the Friendly Farmer, with Bess the Pyrenean mountain dog. Traditionally in Ireland, the working farm dog has always been the border collie and this is still the case today. The black and white pooches with their low, loping, stride are still a familiar sight on the backroads and laneways of the countryside moving their woolly charges from one pasture to the next. Other herding breeds are occasionally used, such as the New Zealand huntaway and the Australian kelpie. A well trained dog with the right temperament is worth its weight in gold to a farmer. In 2007 Ronan Byrne returned from Poland, where he had managed a large scale dairy farm, to the family farm outside Athenry, east Galway. He had grown up on this 35 acres which once belonged to his grandparents. He switched to an ‘open pasture’ method of farming in an attempt to redress the balance of intensive poultry production and the demand for better quality. 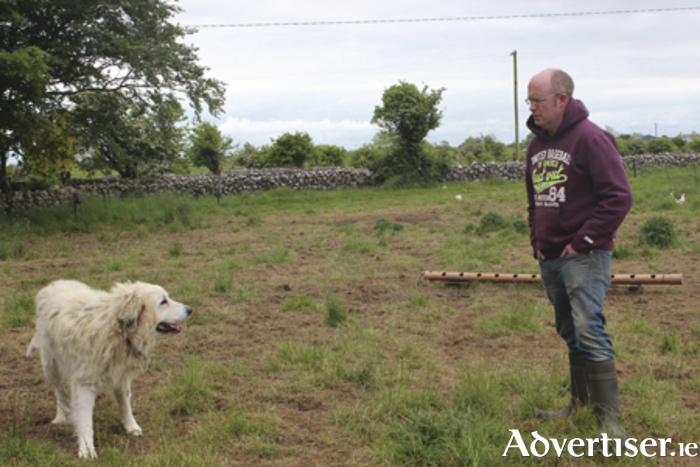 Ronan has worked hard since then in getting his open pasture farm in Knockbrack established. He is now recognised as a key supplier of top quality poultry not only in the west of Ireland but also to restaurants around the country. While he still keeps a few Hereford cross cattle, he concentrates on poultry, supplying chickens, ducks, geese, and the famous bronze turkey at Christmas time. One of the biggest obstacles to running a successful open pasture poultry operation is predators — foxes, minks, and dogs. When searching for a solution, Ronan came up with something a little different, one of the highlights of his style of farming. His new farmhand came in the shape of man’s best friend. One with more than 10,000 years of agriculture experience and naturally hardwired for the job in hand. Livestock guardian dog (LGD ) breeds have been used for centuries to protect livestock from wolves in Europe and Asia. If trained properly they will protect whatever livestock they live with. In the United States, where they have coyotes, opossums, racoons, owls, and hawks to think about, the most well-known of these breeds are the Pyrenean mountain dog, Anatolian shepherds, akbash, and maremma. Many also work as family and home guardians, and several are assistance dogs to their disabled owners, as they are sturdy enough to provide physical support. With the right socialisation, training, and physical environment, LGDs can be successful family pets and home protectors. They are generally aloof toward strangers and their size alone is rather intimidating. Though strong, independent-minded, and protective, they are normally gentle with children and livestock alike. Ronan’s first recruit was Bess, a pure white Pyrenean mountain dog, who has lived at the farm since she was 12 weeks old. Pyrenean mountain dogs are one of the oldest dog breeds in the world. They were bred as dogs of war and then used during peacetime as sheep-guarding dogs. The Pyreneans are one of the least aggressive of the large guardian dogs, so often people cherish them as family dogs. They are regal and independent compared to other dogs breeds, traits necessary to spend days alone guarding flocks. Bess has proven to be a great help on the farm, so much so that a second helper was employed, Bruce the Polish tatra sheepdog. LGDs are most effective when working in pairs, the alpha dog routinely makes a patrol of the home base while leaving the more submissive partner to stay with the flock. The Polish tatra sheepdog is used for herding and as a guardian for flocks of sheep and goats. It can also be kept as a companion and a watchdog. This natural working dog is self-thinking, highly intelligent, and able to assess situations without human guidance. They are devoted and loving to their family and close friends but will often be reserved around strangers. They will give big warning barks at anything deemed suspicious or strange, they will also deter two-legged predators and they make an excellent 'door bell'. The Polish tatra sheepdog will not bite a stranger or other animals unless continuously provoked. When left outside they will be awake and vigilant during night hours, patrolling the property. Luckily for Bruce, they love snow and cold weather and are very weather resistant. They also get along with other non-canine pets and are very gentle with children. Judy the sheep dog and her pups complete the canine staff on the Friendly Farmer’s Knockbrack poultry farm. Livestock guardian dogs are an ancient solution to a common farming problem.